Low iron in pregnancy is common, but thankfully there are simple and effective ways to boost your levels and your energy. I’ve suffered from the effects of low iron in pregnancy for close to ten years. I’m currently pregnant with my fourth baby and soon after my first round of blood tests I got straight onto iron medication because my levels were low and my iron stores were virtually non-existent. It didn’t come as much of a surprise as I know the symptoms – severe exhaustion, dark circles under the eyes, a pale complexion and a strong desire to crunch ice (strange, I know, but it’s a classic sign of anaemia!). Iron is an important dietary mineral that is involved in various bodily functions, including the transport of oxygen in the blood. This is essential in providing energy for day-to-day life. When you have low iron your body doesn’t have the ability to build enough red blood cells hence it can’t keep your hemoglobin at the right level. This can lead to tiredness and decreased immunity. Why is low iron in pregnancy so common? What are the best treatment options during pregnancy? When your midwife, OB or GP have confirmed that you are suffering the effects of low iron (via a blood test), they will suggest a liquid or tablet supplement to help boost your levels. They may also suggest a diet that consists of iron-rich foods including red meat, leafy green vegetables, beans and iron-fortified breads, cereals and pastas. Taking supplements and eating iron-rich foods is all good and well but you also want to make sure that your body is absorbing the iron. The best way to ensure this happens is to increase your Vitamin C intake as it aids the absorption process. Unfortunately there are foods that inhibit absorption so it is recommended that you steer clear of coffee and tea, dairy, soy and eggs within a few hours of taking your supplement. Your health care provider may also suggest foods high in fibre to counteract the not-so-pleasant side effects of taking iron supplements – constipation. Alternatively, look for a supplement that is gentle on the stomach and digestive system (they do exist!). 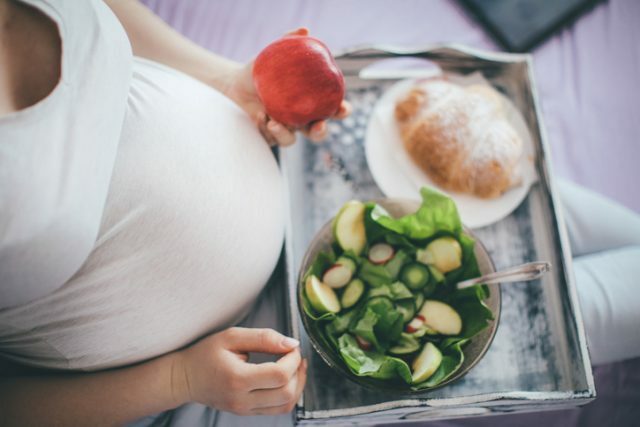 Related: Foods To Avoid While Pregnant: What’s Really Off-Limits? How will you feel when your iron levels increase? Amazing! There’s a lot to be said for increased energy, especially in pregnancy. With more energy I have a greater desire to get out and about, tick jobs off the list and exercise. Indeed, everything has been just a little bit easier because I don’t feel like I need a nap every few hours. Incidentally, it’s a good idea to keep an eye on your iron levels once your baby is born too, especially if you are breastfeeding. Chat to your GP at your six week check up about keeping your iron levels in a healthy range so you can stay energised and well during the first few years of motherhood.